All of our playsets are designed for easy installation. We pre-drill, pre-sand, and pre-stain all main beams. We even include all required hardware and detailed step-by-step instructions. 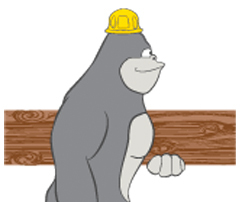 The average Gorilla playset will take 2 adults approximately 6-8 hours to construct. With that said, we understand you may prefer to hire a professional to install your new swing set. We have gathered a nationwide list of independent playset installation companies to make your selection process easier. To see installers in your area, click here.